Unusual things catch Vinay Narkara��s eye. Like pen nibs and the Maharashtrian nath (nose ring). 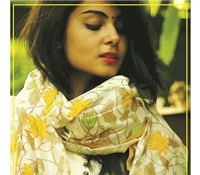 a�?You will find these fun block-prints on my cotton saris,a�? says the lawyer-turned-designer, adding that another highlight is a collection inspired by US artist Mark Rothkoa��s paintings, as his a�?colours reflect my stylea�?. The 39-year-old from Solapur became interested in textiles after he designed a sari for his wife. Today, he works with weavers from Gadwal in Telengana and concentrates on kuttu work (an interlocking weave). 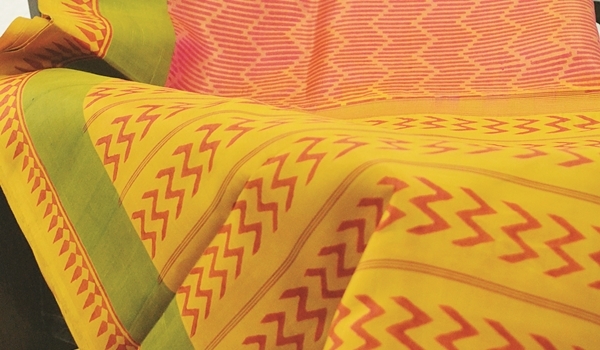 a�?I combine different fabrics to give saris more texturea��like cotton with a silk border. Ia��ve also updated the colour palette, bringing in bright shades and colour-blocking,a�? says Narkar. City-based Vidyuth Sreenivasan has always been around block printsa��his mother had started a unit on their terrace in 1984. So the 38-year-old didna��t think twice about leaving his advertising job (with JWT) 10 years ago to a�?explore my creativity and help weavers.a�? With a printing unit in Salem, he works with cottons and silks, but says he loves his chaani saris (a light dhoti-like material). a�?I only work with geometric prints. Ia��m inspired by British artist Bridget Rileya��s work. In my latest collection, expect lines that will create an effect of movement, like an optical illusion.a�? From Rs 900.
a�?I love nature and all my work is inspired by it,a�? says Bidisha Bhaduri, who left her job in sales in the US (in 2005) to work with karigars in her hometown, Kolkata. a�?I love kantha and batik. Originally, kantha used folk designsa��of peacocks and the like. But I brought in florals and geometric patterns. I also moved away from the traditional colours to incorporate bright pinks, peaches, reds and greens,a�? says the 48-year-old, who gets her tussar from the Birbhum district because a�?it is softera�?. For Chennai, she has a twin lotus motif that she is especially proud of, besides flowers like lilies and petunias. a�?I also have paisleya��but not the typical clusters. Mine are distinct, separate.a�? From Rs 4,000. A NIFT graduate, Delhi-based Anoop Rai believes his medium, Chanderi silks and cottons, needs a touch of the fresh. a�?With inlay and extra weft, we create designs that steer away from traditional polka dots and paisley. Instead, we do Oriental lotuses, stylised designs from architecture, and flora and fauna,a�? says the 33-year-old, adding his colour wheel is dominated by a�?happy coloursa�? like pinks, oranges and lemon yellows. a�?I also do hand screen printing, with pop prints like scooters, gramophones and tulips. For Chennai, I have a line inspired by designer-poet William Morrisa�� intricate botanical prints.a�? From Rs 1,500.